Top Insights Shaping the Automotive Industry in 2019 - Cox Automotive Inc.
Jonathan Smoke, Chief Economist at Cox Automotive discusses the economic outlook for the automotive industry into 2019. Isabelle Helms, Vice President of Research & Market Intelligence, shares findings from the Cox Automotive Service Industry study to help dealers understand how to take advantage of these trends and differentiate themselves in the marketplace. Benefit of Strong Economic Tailwinds from 2018 – 2018 saw a robust economy with full-year GDP growth around 3% — the strongest year since 2014. Unemployment reached new lows and consumer confidence soared to an 18-year high, all which boded well for car buying. The tax reform signed into law at the end of 2017 began to impact payroll and taxes in February 2018. So the net result is the average consumer had almost $2,000 more to spend than they did the prior year for a strong vehicle sales environment, albeit blunted somewhat by the rise in loan interest rates. New Inventory versus Used Inventory – Crossover SUVs continue to outpace cars sold in the new vehicle market, as most automakers have retooled to prioritize this product type. So consumers looking for an affordable, midsize or compact car are more likely to find that vehicle in the used market as opposed to the new market – a key part of the demand that’s currently driving used vehicle sales. Interest Rates – The most negative factor impacting consumer demand in 2018 was the rise in interest rates that translated into a rise in the average payment for a vehicle. The price that increased the most was the average lease, so leases became far less attractive relative to alternatives like financing a new or used vehicle purchase. Tariffs – In 2018, tariffs increased the price of new vehicles by roughly 2%. Initially, tariffs were on steel and aluminum sourced worldwide, including from trading partners in Mexico and Canada. Later tariffs affected many Chinese components, especially electronics on new vehicles. Luxury cars and crossover vehicles are heavily dominated by imports and are particularly sensitive to tariff legislation. The added expense and uncertainty of additional tariffs are being closely monitored in 2019. Relaxed Borrowing Standards – Overall, there was plenty of credit available in 2018 compared to 2017 and consumers took advantage of that. More subprime borrowers were able to obtain loans on both new vehicles and used vehicles in 2018 – a leading reason for both new and used vehicle sales growth. The implication is that lenders saw advantages in subprime loans given low unemployment and low delinquencies. Improving the Online Experience – There are a number of successful models where consumers are provided the opportunity to complete many of the purchasing steps online and then visit a dealership to complete the paperwork or even have the car delivered in their driveway. Yet there is still room for improvement in digital retailing. The biggest opportunity remains the amount of time that it takes a consumer to get through the entire purchase process. A time-consuming F&I process is stressful and a primary source of customer dissatisfaction. Consumers want to complete parts of the car buying process online prior to visiting the dealership and engage with digital technology while at the dealership so they’re not sitting idle for hours waiting for the paperwork to be finalized. Addressing these opportunities provide significant benefits to dealerships. Recapturing Service Business – Our research shows that 70% consumers who purchased a vehicle from a franchise dealer did not return to that dealer for service business in the subsequent year. The lost service revenue is a costly missed opportunity. Consumers are taking their vehicles elsewhere due to the perception of higher costs and inconvenient dealership locations. Dealers can offer consumers enhancements to overcome these shortcomings and recapture service revenue. For example, the ability to review and approve estimates electronically, creating transparency with videos or picture captures, and offering valet services are some options to differentiate the customer experience and provide flexibility and personalization. Changing Attitudes about Car Ownership – Consumers are starting to rethink whether or not owning a vehicle is a necessity. While transportation is critical, a growing number of consumers are interested in alternatives to a personally owned vehicle. This includes third-party ride hailing and car sharing services, as well as subscription services offered by some OEMs and large dealer groups. In our findings, dealers believe that car subscription and car sharing services can provide a new revenue stream and appeal to a new customer base. It’s important that dealers chose the right partners with demonstrated experience to ramp up car subscription and car sharing services inside their stores. The ideal scenario for a franchise dealer could be a partnership with a manufacturer as well as an independent third party. 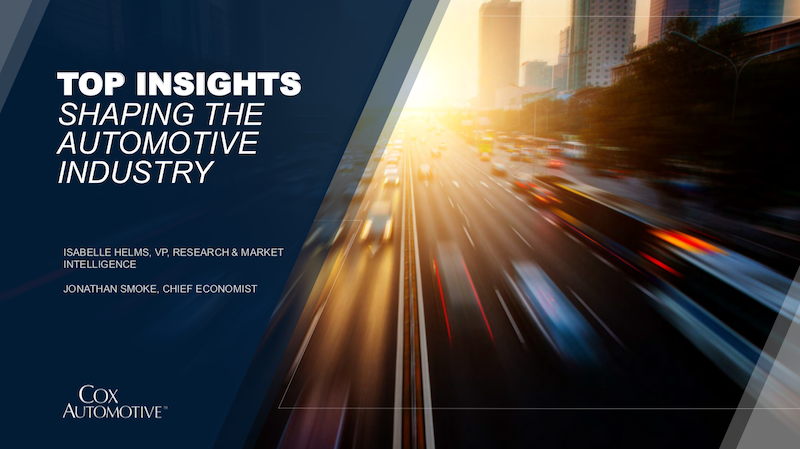 Get a copy of the slides presented in the video by Jonathan Smoke, Chief Economist at Cox Automotive, and Isabelle Helms, Vice President of Research & Market Intelligence.